No match for his bodasity! There was no match for his bodasity. 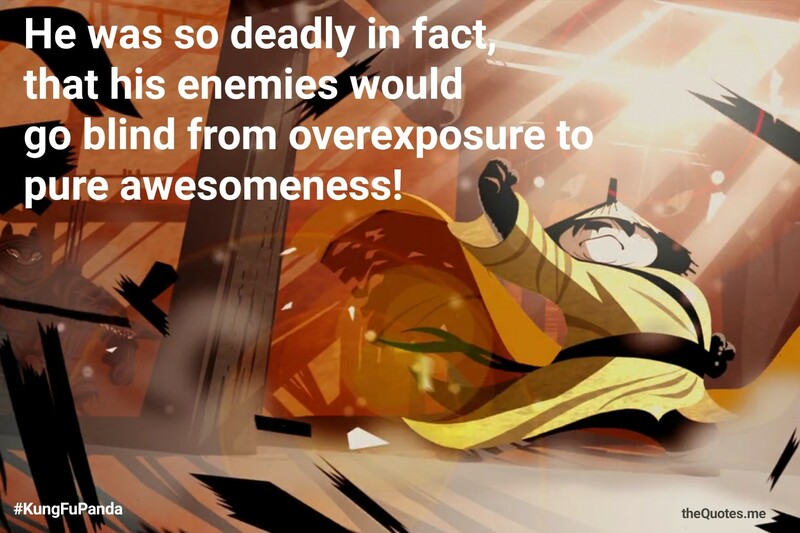 He was so deadly in fact, that his enemies would go blind from overexposure to pure awesomeness. Author theQuotes.mePosted on September 30, 2017 April 10, 2018 Categories Animated, Jack Black, Kung Fu Panda, Movies, PoTags 3 dimensional, abandoned child, absurdism, actor shares first name with character, acupuncture, afterlife, ancient-china, animal, animal in title, animal protagonist, anthropomorphic animal, anthropomorphism, arrow catching, attitude, attractiveness, awesomeness, backstory, biting own tail, blind, blockbuster, bo-staff, bodasity, body armor, bow-and-arrow, bowl, brawl, breaking through a door, bridge, broken vase, bull, burnt-body, calligraphy, cannon, cgi animation, character repeating someone else's dialogue, cherry-blossom, chi, chicken, China, chinese-food, chinese-medicine, chinese-noodles, chopstick, chosen-one, closing-credits-sequence, clumsiness, computer-animation, confidence, cooking, courage, crane, crane the bird, crater, death of friend, death-of-mother, deception, Destiny, destroyed-wall, dragon, dream-sequence, dumpling, dynamite, enemies, escape from prison, evacuation, exploding boat, exploding body, exploding ship, falling down stairs, falling from a tree, falling from height, falling through the floor, falling-down-a-hill, family abandonment, family relationships, fat-guy, father figure, father son relationship, father son reunion, Fight, fighting-in-the-air, Fire, firecracker, fireworks, first-part, fist, fistfight, flashback, fleet, flower petal, foot chase, freeze-frame, friendship, furry, furry fandom, genocide, giant-panda, good versus evil, goose, Gun, hand to hand combat, head bashed in, Hero, hit in the crotch, hit with a door, hope, hug, immortality, impersonation, insanity, insubordination, Jack Black, jumping-off-a-roof, jumping-through-a-window, karate, karate-team, kicked in the crotch, kicked in the face, kicked in the head, kicked in the stomach, knocked out, Kung Fu, Kung Fu Panda, kung-fu-in-title, kung-fu-master, kung-fu-tournament, landing on one's head, Lantern, laziness, levitation, loss-of-mother, lying, mace, macguffin, martial-arts, master, Memorable Quotes, mentor, Might, mind-control, Mission, monkey, mother-son-relationship, needle, no-opening-credits, nunchucks, obesity, open-ended, overeating, palace, Panda, peach-tree, peacock, peafowl, pig, Po, Power, praying-mantis, presumed-dead, pride, prison, prison-escape, punched-in-the-face, punched-in-the-stomach, punching-bag, pursued-by-wolves, quitting-a-job, rabbit, radish, red-panda, repeated-line, repressed-memory, reunion, Revenge, rhinoceros, rope-bridge, scene-after-end-credits, scroll, second-part, secret, self-reflection, sequel, set-on-fire, sifu, slacker, slow-motion-scene, snake, snow-leopard, soothsayer, soup, spirit, split-screen, stalactite, stepping-on-someone's-foot, stop-motion-scene, super-strength, supernatural-power, talking-animal, teacher, teacher-student-relationship, teeth-knocked-out, telling-a-joke, tenderness, third-part, thirty-years, thrown-from-a-bridge, thrown-through-a-wall, tiger, tigress, title-directed-by-female, training, training-montage, turtle, underdog, village, viper, voice over narration, walking stick, warrior, wilhelm scream, wok, wolves, wooden dummy, wuxia, year 2008, year 2011, year 2016, yin and yang, young version of characterLeave a comment on No match for his bodasity! 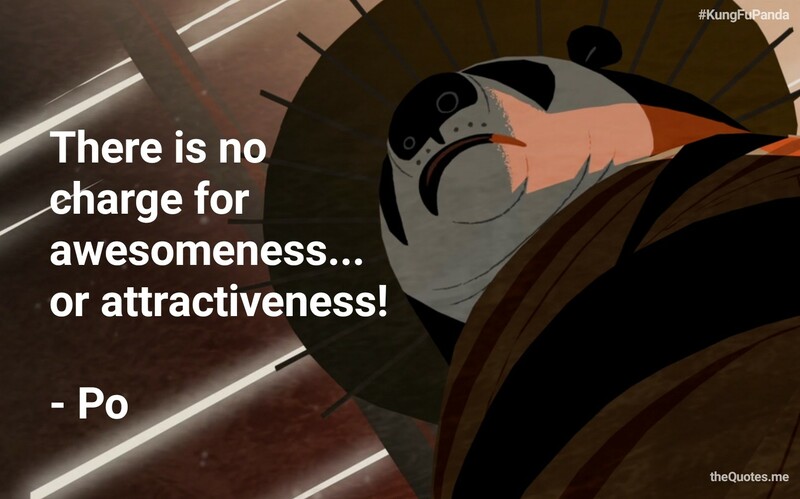 Author theQuotes.mePosted on September 27, 2017 February 2, 2018 Categories Animated, Jack Black, Kung Fu Panda, PoTags 3 dimensional, abandoned child, absurdism, actor shares first name with character, acupuncture, afterlife, ancient-china, animal, animal in title, animal protagonist, animals, Animated, anthropomorphic animal, anthropomorphism, arrow catching, attitude, attractiveness, awesomeness, backstory, biting own tail, blockbuster, bo-staff, body armor, bow-and-arrow, bowl, brawl, breaking through a door, bridge, broken vase, bull, burnt-body, calligraphy, cannon, cgi animation, character repeating someone else's dialogue, cherry-blossom, chi, chicken, China, chinese-food, chinese-medicine, chinese-noodles, chopstick, chosen-one, closing-credits-sequence, clumsiness, computer-animation, confidence, cooking, cost, courage, crane, crane the bird, crater, death of friend, death-of-mother, debt, deception, Destiny, destroyed-wall, dragon, dream-sequence, dumpling, dynamite, escape from prison, evacuation, exploding boat, exploding body, exploding ship, falling down stairs, falling from a tree, falling from height, falling through the floor, falling-down-a-hill, family abandonment, family relationships, fat-guy, father figure, father son relationship, father son reunion, Fight, fighting-in-the-air, Fire, firecracker, fireworks, first-part, fistfight, flashback, fleet, flower petal, foe, foot chase, freeze-frame, friendship, furry, furry fandom, genocide, giant-panda, good versus evil, goose, Gun, hand to hand combat, head bashed in, Hero, hit in the crotch, hit with a door, hope, hug, immortality, impersonation, insanity, insubordination, jumping-off-a-roof, jumping-through-a-window, karate, karate-team, kicked in the crotch, kicked in the face, kicked in the head, kicked in the stomach, knocked out, Kung Fu, Kung Fu Panda, kung-fu-in-title, kung-fu-master, kung-fu-tournament, landing on one's head, Lantern, laziness, Legend, levitation, loss-of-mother, lying, mace, macguffin, martial-arts, master, Memorable Quotes, mentor, mind-control, Mission, monkey, mother-son-relationship, needle, no-opening-credits, nunchucks, obesity, open-ended, overeating, palace, Panda, peach-tree, peacock, peafowl, pig, Po, praying-mantis, presumed-dead, pride, prison, prison-escape, punched-in-the-face, punched-in-the-stomach, punching-bag, pursued-by-wolves, quitting-a-job, rabbit, radish, red-panda, repay, repeated-line, repressed-memory, reunion, Revenge, rhinoceros, rope-bridge, scene-after-end-credits, scroll, second-part, secret, self-reflection, sequel, set-on-fire, sifu, slacker, slow-motion-scene, snake, snow-leopard, soothsayer, soup, spirit, split-screen, stalactite, stepping-on-someone's-foot, stop-motion-scene, super-strength, supernatural-power, talking-animal, teacher, teacher-student-relationship, teeth-knocked-out, telling-a-joke, tenderness, third-part, thirty-years, thrown-from-a-bridge, thrown-through-a-wall, tiger, tigress, title-directed-by-female, training, training-montage, turtle, underdog, village, viper, voice over narration, walking stick, warrior, wilhelm scream, wok, wolves, wooden dummy, wuxia, year 2008, year 2011, year 2016, yin and yang, young version of characterLeave a comment on How can I repay you?